After program starts, click Menu -> Settings to bring up Settings screen. A: AST user ID and password: You need to use the same user ID when you used to sync your MWS account with ASellerTool. B: Amazon seller ID: If you are a US seller, use ATVPDKIKX0DER as Marketplace ID. You can find your seller account ID here. C: Fulfillment Channel: Choose to list your items as FBA or MF. You can switch between them. D: Box Content (FBA only): If you ship everything in one box, you can skip it. If you ship multiple boxes in a shipment, Amazon requires you to provide box content information for each box. You can choose to use the 2D barcode to show box content. 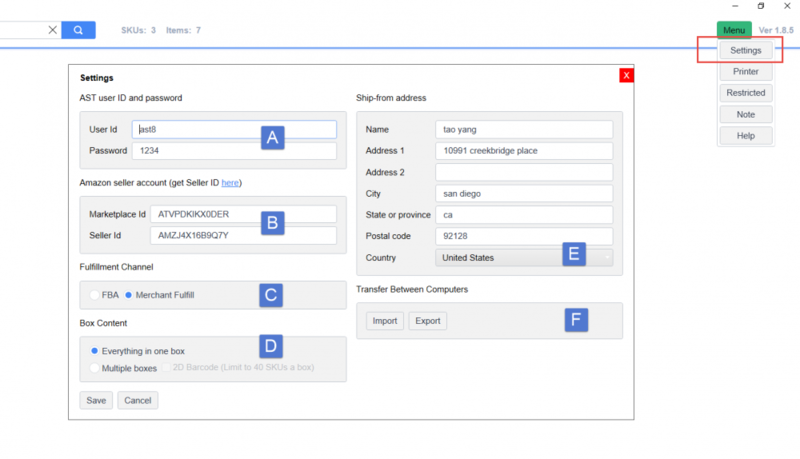 E: Ship-from address (FBA only): Specify the address where you ship the FBA items from. F: Transfer Between Computers: Click “Export” to backup your settings and work into a file. Click “Import” to retrieve your backup. The backup file is also where we can help you troubleshoot.